For those of you that know me, I have been gut renovating my two family while living in it! Imagine that! It has been a journey from beginning to end. We are finally passed multiple inspections, redesigning a staircase up to the master bed and bath addition in what used to be our attic and finally we arrived to all the fun stuff, paint, flooring, and finishes. I love the look of marble. It looks sleek and grand and in white/grays it really becomes a centerpiece in the kitchen. But to much of my disappointment it is not easy to care for. Ideally white is the primary color I would love to contrast our gray cabinets. Then I imagined the dinner parties and glasses of wine spilling all over our white marble countertops. Not a good picture. We will eventually move out and rent out our space and I can only imagine anyone renting will likely not take the same care I would to my gorgeous marble countertops. So marble is out! I’m not a huge fan of quartz, at least not the patterns that I have seen, but I did fall in love with a client’s kitchen countertops recently. They had concrete countertops! If I could only find white concrete countertops then I would be set. I ventured to a local concrete slab company and they had some samples, none that were white. I come to learn that they also require a great deal of maintenance. They can also stain. They do apply a sealant to help prevent against this but it was unclear what white would look like. The local company told us of a local bar where they installed white counter tops. What better test than to see the traffic of a bar on the countertops after one year of use. We sat down, had some pretty yummy cocktails and appetizers but were dismayed to see the staining on the pink-off-white countertops. They were certainly no match to the white marble countertops I originally hoped to have in my kitchen. Concrete is out! If you know anything about me, I am relentless to find the solution. It was hard hat time! We ventured down to MS International. They have a HUGE warehouse and even require that you wear a hardhat which of course made it a fun experience to shop. What was even better I could now compare marble to granite to soapstone to quartz to quartzite all in one swoop! 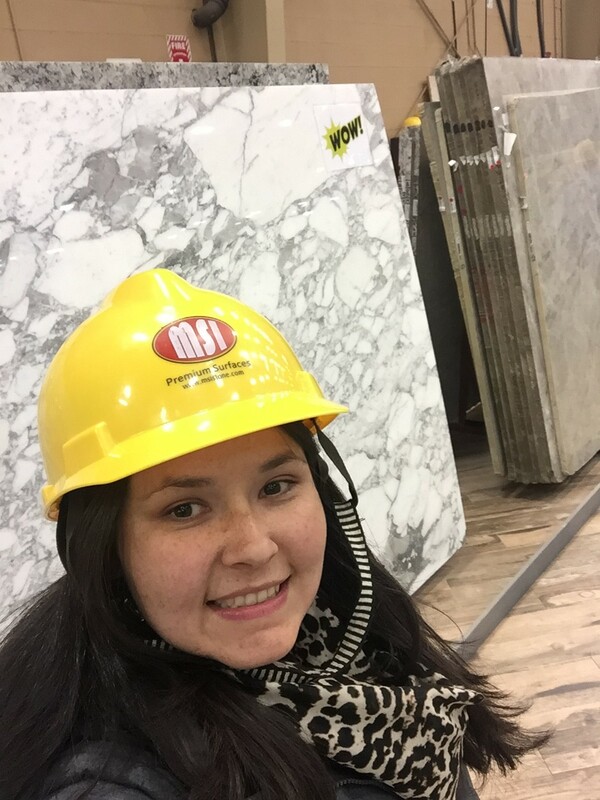 I’m still very deeply in love with marble so I ask the guy in charge, Jim, which countertop should I consider for durability. His response in this order was to look at “Quartz, granite, quartzite, soapstone, and lastly marble”. 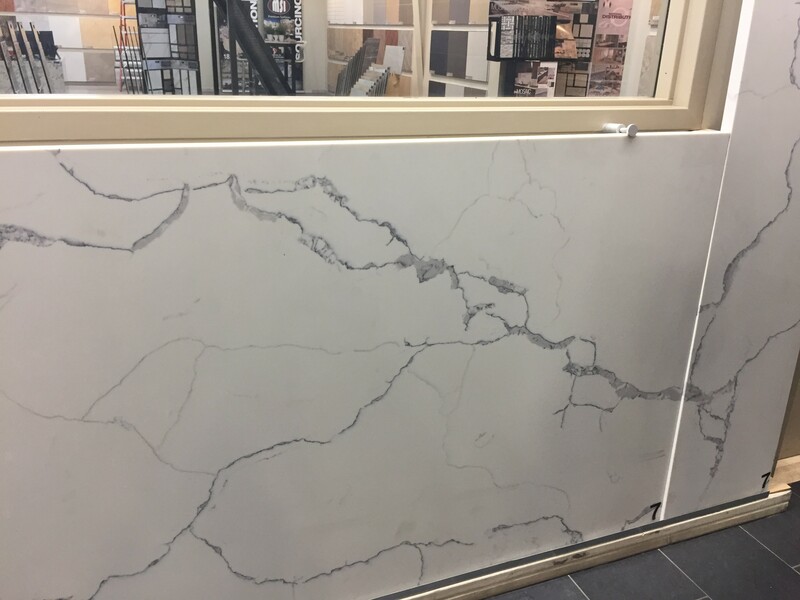 So of course my next question was “Is there a quartz that looks like marble?” This is apparently the most popular question through the door and at the very front of the showroom there are samples of quartz that look like marble. So that concludes our countertop journey! One chapter down, many more to go! I’ll have my before/after photo updates soon! Maybe I’ll buy marble and concrete countertops in my future settle down single family home.